The central nervous system consists of more than 100 billion neurons that form multiple contacts (synapses) and thus represents the most complex organ in man. The activity of this neuronal network is generated by a coordinated interplay between excitatory and inhibitory neurons. On the molecular level, the balance between excitation and inhibition is controlled by an interplay of synaptic proteins, both in space and in time. This process is controlled by the correct concentration of ion channels and neurotransmitter receptors, as well as by their regulation via kinases, phosphatases and other enzymes. Anchor proteins immobilize ion channels and receptors at the synaptic cytoskeleton and tether together functionally related proteins. These mechanisms lead to the formation of synaptic signal complexes that control amount, localization and activity of ion channels and neurotransmitter receptors, thereby regulating the quality and intensity of synaptic signal transduction. Synaptic signal complexes are dynamic structures that assemble and disassemble in time, depending on the physiological state of neurons. Dysfunction in the composition and regulation of these protein complexes may cause neuronal malfunction and pathophysiological processes, e.g. 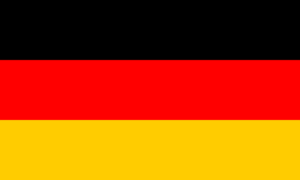 night blindness, epilepsy, schizophrenia, parkinsonÂ´s disease, autism spectrum disorders and chronic glaucoma. Thus, synaptic signal complexes represent interesting drug targets. We analyse the composition, expression, structure and function of synaptic signal complexes that are associated with receptors for the excitatory neurotransmitter glutamate, the inhibitory neurotransmitters γ-aminobutyric acid (GABA) and glycine, as well as with other ion channels (voltage-gated chloride channel – ClC, epithelial sodium channels – ENaC). The figure gives an overview of proteins identified from us that interact with intracellular domains of metabotropic (G-protein coupled) glutamate receptors (mGluR) and GABAc receptors (GABAcR). Metabotropic glutamate receptors (mGluR) and GABAc receptors (GABAcR) are anchored by several transmembrane domains (black vertical rectangles) in the cell membrane (blue horizontal rectangle). At the lower side of the membrane are intracellular receptor domains (red) that contain binding motifs for cytosolic proteins. 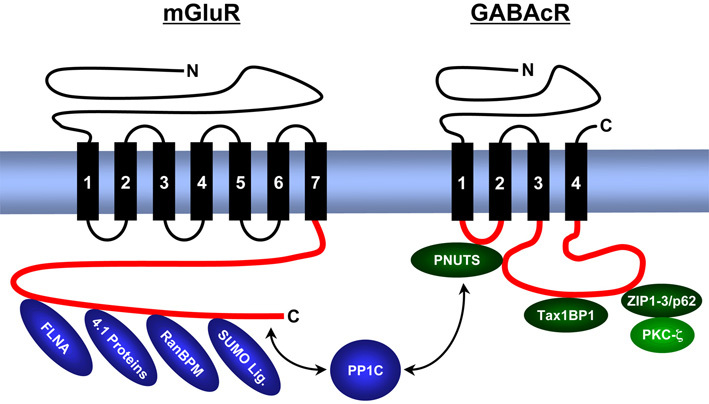 PNUTS binds simultaneously GABAcR and proteinphosphatase 1 (PP1C), ZIP proteins/p62 interact simultaneously with GABAcR and PKC-ζ. Thus, both protein complexes ensure a close vicinity of the catalytic enzyme activities with the receptor. In contrast to GABAcR, mGluRs bind PP1C directly, as well as the cytoskeleton-associated band 4.1 proteins, Filamin-A (FLNA) and proteins of the cellular SUMOylation machinery (RanBPM, SUMO ligases). We localize interacting proteins in the central nervous system (retina) by immunohistochemistry, map binding domains by a combination of molecular biological and protein chemical techniques and analyse their three dimensional structure using bioinformatic (computer based homology modelling, molecular dynamics simulations) and biophysical techniques (CD and NMR spectroscopy). As a result of these studies we postulate the existence of trimeric synaptic signal complex, composed of GABAc receptors / PNUTS / PP1C, as well as of GABAc receptors / ZIP proteins / PKC-zeta. The enzymatic activities of the phosphatase and kinase regulate the phosphorylation level and surface expression of GABAc receptors. Other signalling complexes contain metabotropic glutamate receptors, PP1C and SUMO proteins and regulate surface concentration and intracellular signal cascades of these neurotransmitter receptors. The figure shows selected data demonstrating an interaction of proteinphosphatase 1 and metabotropic glutamate receptors in bipolar cells of the retina. Left: A vertical cryostat section of the retina was incubated with proteinphosphatase 1 (PP1γ1) specific antibodies (green) and an immuneserum recognizing rod bipolar cells (red). The double exposure of the section shows expression of PP1γ1 in both synaptic layers (OPL, IPL) on dendrites and axon terminal systems of bipolar cells (yellow). Middle: Metabotropic glutamate receptors (mGluRs) interact with recombinant (E.coli) and native PP1γ1, but not with PKC-ζ in GST pull-down assays. Right: Electrostatic potential of the PP1γ1 surface in complex with the PP1γ1-binding motif KSVTWY of mGluR7b. For further explanation please see: Croci et al., 2003 J Biol Chem 278:50682-50690; Meiselbach et al., 2006 Chemistry & Biology 13:49-59. An elevated concentration of the excitatory neurotransmitter glutamate is discussed as an important factor in neurodegeneration, a process termed excitotoxicity. In chronic glaucoma, this mechanism could result in retinal ganglion cell death, degeneration of the optic nerve and finally blindness. While extensive studies analysed the relation between ganglion cell death and ionotropic glutamate receptors (especially of the NMDA-type), the behaviour of metabotropic glutamate receptors in neurodegeneration is largely unknown. Thus, we analyse the retinal gene expression in a mouse model for chronic glaucoma, in which apoptotic processes of retinal ganglion cells cause degeneration of the optic nerve. Compared to control animals we found a significant upregulation of several metabotropic glutamate receptors and epithelial sodium channels (ENaC) while the expression of GABAc receptors remained unchanged. Using DNA-chips and subtractive hybridization techniques we identified additional proteins that are differentially regulated in glaucomatous retinae and thus could be part of the mechanisms leading to ganglion cell death.